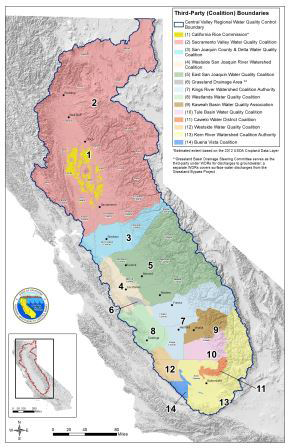 The Central Valley Water Board has allowed growers to combine resources by forming water quality coalitions (also referred to as a third-party). The coalition groups work directly with their member growers to assist in complying with Central Valley Water Board requirements by conducting surface water monitoring and preparing regional plans to address water quality problems. Under the waste discharge requirements (current program), which protect both surface water and groundwater, growers can still join a Coalition group. To join a Coalition group, growers must follow instructions depending on the location of parcels that are required to have regulatory coverage. The location determines which application process applies. Please see information on how to apply to join a Coalition. Growers are required to comply with the Water Code, but are not required to join a coalition. Growers may comply with the Water Code by filing for coverage under Waste Discharge Requirements for Discharges from Irrigated Lands for Individual Growers. If growers do not obtain regulatory coverage for their waste discharges, they must file a Report of Waste Discharge (Form 200) and pay a filing fee to the Central Valley Water Board to obtain a grower-specific permit, or cease to discharge wastes that may affect the quality of state waters. For additional information, please contact ILRP, or apply to join a Coalition.